Could you solve the challenges and clues from curious characters and contraptions, gather gold, gamble, bribe and blackmail your way through to victory. You will get a hilariously silly adventure and one which you will never forget on this hut the the Smoking Caterpillar. Thanks to Buckbuck for letting some of us from the Love Pop Ups London community come down to hunt for the Smoking Caterpillar. Read our blogs/reviews from the comments below. The Hunt for the Smoking Caterpillar is unusual and fun. Overall well done BuckBuck Games! And thank you to Love Pop Ups – London for the experience. 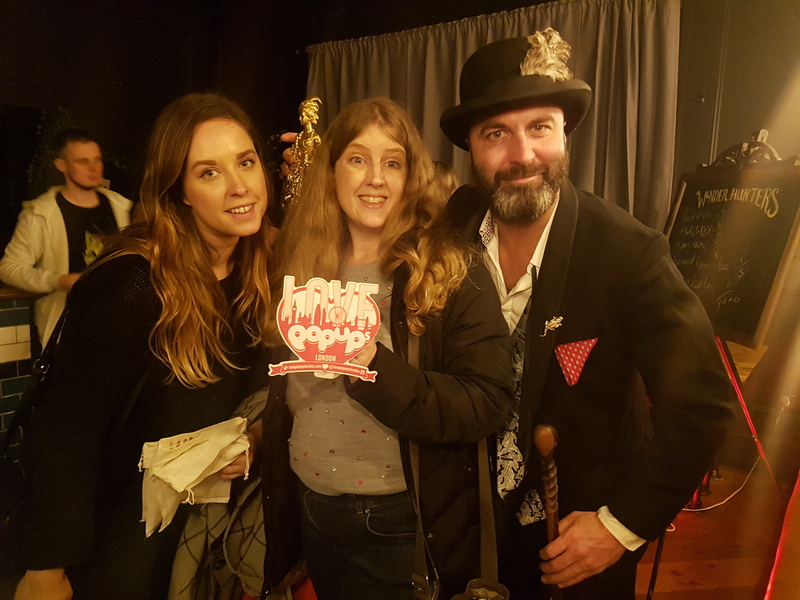 Since I love games, treasure hunts and escape rooms, I was really pleased to get an invite from Lovepopupslondon. So what is BuckBuck Games’ Hunt for the Smoking Caterpillar? I was curious and really looked forward to this immersive game. At the Owl & The Hitchhiker Pub, we meet the lovely Rabbit, who after giving one of our team of four a pouch, takes us all upstairs. There we were offered an orange coloured cocktail from the Alchemist who had been mixing it for us. It tasted very orangey and strange, but with a kick to it. I think it would have been nice to also have a choice of something non-alcoholic as an alternative rather than just water? Once we were joined by other teams, consisting of 2, 3 or 4s, the Baron introduced us to all the different characters, the Alchemist, the Fool, and the Beauty, and explained that we need to find Russell the Smoking Caterpillar. We were all given some gold to help us in our quest. Then we had to line up in accordance to the playing card value found inside our pouch. Since we had an Ace, we were first in the line up. However, this did not make much sense, as we soon lost that spot as the Baron called us over to give each of us in our team a Wonder Penalty voucher which we could use to hand to any “wrongun” and fine them lots of gold to rectify their wrongdoings. At first, I thought this is great, but, however, this backfires, as no one wanted to give up their gold! The characters were very good and we had to interact with them to solve puzzles and clues to earn ourselves more gold. I was a little confused at first, and since there were quite a lot of teams, it seemed a little chaotic, but it all added to the mystery and weirdness of the whole game, as we try to outwit each other to solve the clues. Finally, with all the teams working together, we discovered the final clue together, which led us to Russell. I thought the game was very cleverly put together, it was very immersive, a bit of treasure hunting and theatre in a room environment, but for me, a little confusing, as I was very competitive to find more gold and keep it for our team, and it was fun doing that, but I am not sure that was entirely the object of the game towards finding Russell, the smoking caterpillar. However, as an alternative fun night out with a group of friends, it works, and I would definitely recommend this game for corporate team building, as it encourages you to work together and cooperate. I got to hold Russell at the end. He is rather cute! Thank you lovepopups for this experience.